WATCH: Sherlock is excited for Baby Watson in new Sherlock series 4 BTS featurette! Sherlock is returning in just two days time and we can barely contain our excitement. 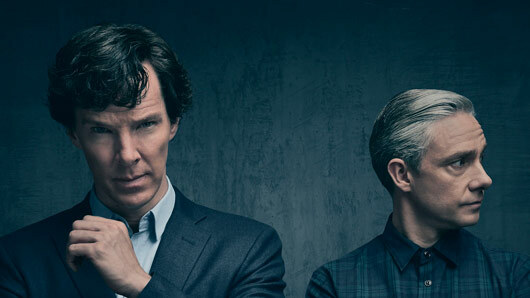 The good folk at the Beeb just love to tease us, so in the lead up to the big day they’re now littering us with the most amazing titbits – including this new BTS featurette featuring Benedict Cumberbatch, Martin Freeman and Amanda Abbington. The focus of the new featurette: John and Mary Watson’s new arrival – and Sherlock’s reaction to it! “Sherlock feels very protective towards them as a family,” says Cumberbatch in the promo. Sherlock returns to BBC One at 8.30pm on New Year’s Day. « 5 TV characters we’d love to party with on New Year’s Eve!